Donde esta el cuarto de bano, Natalie? Yup, that’s about the only Spanish I know. Natalie Imbruglia, who apparently still exists, was out and about in cloudy London with her husband, Mc Skat Cat (I just assume). I remember when my mom gave my sister a bowl-cut when we were little. It scarred her for life. 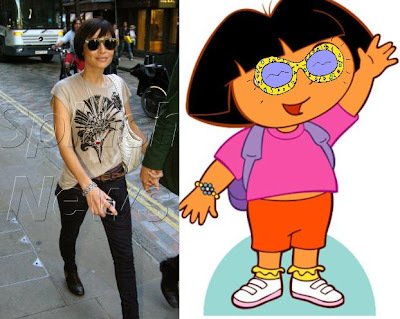 However, Natalie is bringing back the bowl-cut with a little help from Dora the Explorer! Ay de mi! See Jen, the bowl-cut is back baby! You were ahead of your time…just not as Spanish.